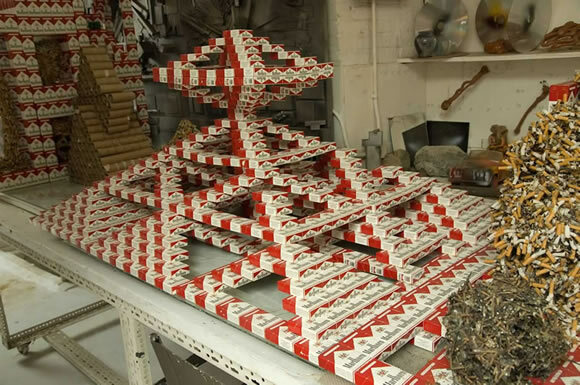 Queens-based artist, John Norwood’s pyramidal sculptures from collected Marlboro boxes. Another example of an artist making use of materials at hand—which often turn out to be used packaging. (See: 1, 2, 3, 4, 5, 6, 7) In this case, of course, the medium is also evidence of the artist’s smoking habits and brand preference. Similar to Marlboro’s own puzzle 4-pack package and other packaging mosaics—(see: Peter Blake)—Norwood’s geometric stacking arrangements seem related to Marlboro’s iconic design. The sculptures follow the same diagonals as the arrow-like “red roof” graphics on the cigarette packs, themselves. Norwood’s fractal-like arrangement uses the packs to create larger, somewhat diffused versions of themselves in a manner similar to Tom Friedman’s reassembled boxes. Sadly, Norwood’s waterfront studio in College Point was destroyed in an electrical file last January.